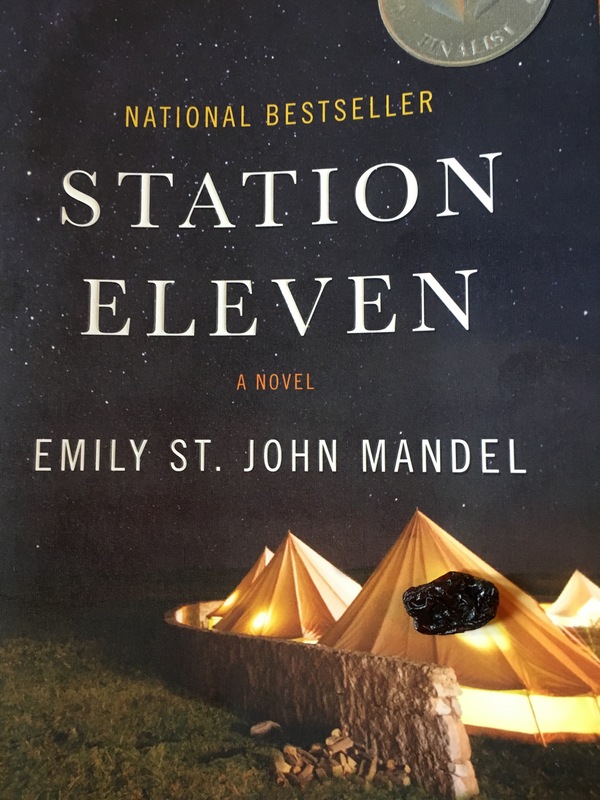 Have you read the book Station Eleven by Emily St. John Mandel? It is one of my absolute favorites. I’ve read it, listened to the audio-book, and am now experiencing the joy of studying it in my apocalyptic fiction class. If you read it, be warned it won’t wow you out of the gate. It’s a long slow dance of a book, and you won’t even recognize there is music until you are a hundred pages in and the true melody isn’t apparent until over 200 pages in. But I think the symphony she creates is worth listening to on repeat. I’m talking about those people who’ve ended up in one life instead of another and they are just so disappointed. Do you know what I mean? They’ve done what’s expected of them. They want to do something different, but it’s impossible now, there’s a mortgage, kids, whatever, they are trapped…. …because I think people like him think work is supposed to be drudgery punctuated by very occasional moments of happiness, but when I say happiness, I mean distraction. You know what I mean? Section 4. The Starship. Chapter 26. Page 160. No spoiler alert here, other than the life changing kind of spoiling. Clark is heading in to do his job. He conducts assessments of executives who need to improve and then makes a plan for their improvement. In this chapter he’s interviewing someone who works for the unnamed executive. Her words cut through my soul. I have moments when I love my real job. Moments when I feel important and valued and when I honestly believe I am making the world change for the better. I love my team and the people I work with completely. But… but… we work in renewable energy. We are largely federally funded. The bottom is falling out of everything. Our leadership team changed and no longer values managers, like me, but values self-managing PhD’s and I have nothing but a bachelors of science. I have indirectly been told that I am not qualified and not worthy. The bureaucracy becomes oppressive and there are days, weeks, months when I can feel my soul shriveling to a tiny soul raisin in my gut. There is enough good at work to keep the soul raisin from drying up completely, but I don’t want to live with a soul raisin. I dream of a soul grape or, can you imagine, a big plump soul watermelon that fills my entire body cavity. …they are like sleepwalkers…and nothing every jolts them awake. So last week I made a change. A scary brave change. I dropped to 32 hours a week. I gave myself a gift of Thursday, so that I can write. So I can try to publish that short story that is almost perfect. So I can write the second draft of that book that calls to me on my 45 minute commute to and from work. So I can finish that second novel that just recently developed a muse who will not shut up. She’s throwing books in my way that inspire me. She’s providing workshop comments from my class that make me want to sob with the joy that somehow my story is pouring out my fingers, onto a page, and translated through reader’s eyes to something even better than I imagined. Stephen King wasn’t kidding. It’s magic. So here I am. I’m doing it. I told my boss. I told my boss’s boss. I told my team. I told them I am taking time off to pursue a masters degree – which I will get to – and to write. (The masters degree makes the whole thing more legitimate to the engineers, and will be relevant to book three.) I told them there was a novel that needed to be edited and another to finish writing. And like most big announcements it had grown so much bigger inside me than it actually was outside of me. People were kind. They were interested. They said they were jealous of my passion. …he had been sleepwalking, Clark realized, moving half-asleep through the motions of his life for awhile now, years; not specifically unhappy, but when had he last found real joy in his work? What was the last time he’d been truly moved by anything? When had he last felt awe or inspiration? So here we go. I’m promising myself a year. A year to finish what I have started. A year to write, edit, submit, get rejected, network, and see where this journey takes me. And even if at the end I don’t end up with a book anyone else will publish then I will do it myself, and I will do it having grown a grapefruit of a soul. Because I want to live all of my life and I want it to be filled with awe, joy, and inspiration with a tiny contrast of drudgery. The drudgery is still important, because if all you know is joy and a watermelon soul you can’t possibly appreciate it, right? Credit for all quotes go to Emily St. John Mandel and her glorious Station Eleven. Thank you for the amazing book, and for providing words to convey my unhappiness, which motivated my change. I’m so happy for your soul! Teeheehee… So happy you’ve made the leap! And thanks for the book recommendation. I’ve picked it up a couple of times but wasn’t sure. Now I am. It is a very different book, but worth reading. Apparently for those who are verb tense aware her use of verb tense is jarring, but I’m oblivious. And… if you hate the book, I’ve got one that I hated that maybe you’ll love! just started Station Eleven yesterday. Love it so far! Oh, that’s a good sign. From my experience you would have hated it already if you were going to hate it. Wait until you get to the work scenes. They’ll make you cringe. I’m so happy for you and this journey of yours (and also jealous because I wish I could do the same)! I certainly ponder it constantly. I am happy for you that you are able to do this! I’ll report back on how it goes! Congratulations! It’s been almost a year since I took the plunge for similar reasons. My skills were undervalued and underused. I was spending too much of my time doing things I hated and not enough doing things I loved. I quit my job to do freelance work instead. I’ve had a slow start that’s been equal parts liberating and terrifying, but I don’t regret it one bit! Oh goodness. Your leap was bigger than mine, but your reasons do sound the same. Have you been able to balance your freelance work and your own writing since taking the plunge? I hope I’m as happy as you sound in a year! You inspired me with your productive summer! Thanks! Now you can add octothorp inspiration to all your stuff too. I cut back my hours 3 years ago and it’s been a fabulous decision. Congrats!! So far so good, but then this is the time of year where school life is crazy for my kiddo, so I haven’t quite found my groove yet. That said, it’s been super nice to not take “time off” for field trips, performances, and festivals. I’d love to be able to do this for three years…. Apocalyptic fiction, that sounds like my kind of class. I love a good dystopia. Great decision. It is such a great class. One of my favorite subjects combined with a spectacular group of people. Who know apocalyptic fiction could be so uplifting, build friendships, and provide inspiration? My last class is next week and I’m already missing my teacher and classmates!